There is no need to install several applications to manage your sales and support channels. One admin panel handles it all. Easy to use and powerful administration panel, where you can control all aspects of your shop. Configure taxons, products, subscriptions, promotions, and much more. Beautiful yet simple and clear layout to sell your digital goods. Multiple product tabs with descriptions, attributes, and a files list. Personalize your shop with your own branding. Each sale generates download and support links for guest purchases. Registered users can also access their order history, address book, downloads, and support. Sell your digital files, software packages, ebooks, music, or any other digital content with ease. You can define multiple product attributes to personalize it and target more customers. You can also sell services or customer support as a standalone service for a certain timeframe. Sell multiple products at once with lower price by defining product bundles that attract more customers. Products and support can be time-limited, restricting access to support and downloads for a set period of time. You can set subscriptions to be perpetual, or a number of weeks, months, or even years. Attract customers with powerful promotional tools, such as auto-generated or manual discount codes, and define them based on time, special events, products and much more. Whether you're an established company or ambitious startup, we'll help you grow and prosper. Give your customers full after-sales care through support subscriptions, without the expense of third-party software. Keep customers happy by managing, organising, and prioritising ticket workflow. 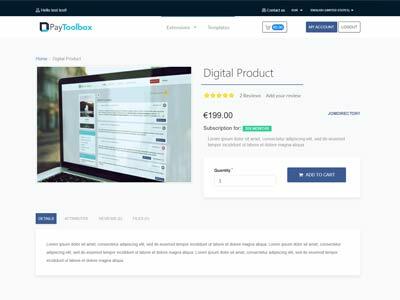 Paytoolbox will send you notifications every time a customer updates or creates a new ticket. 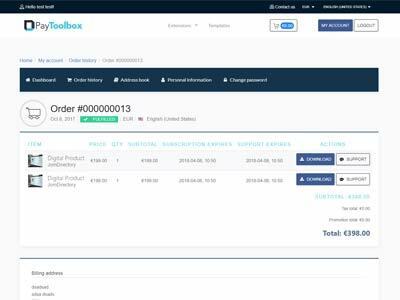 Access all the information you need to help your customers, including order information and support details. Handy visual editor to present ticket information in a readable format. Sell to customers at home and abroad with multilingual support for all of your products. Configure language settings from within Paytoolbox. Personalize your products and make them easier to understand by using product associations. Find out what customers think about you and your products with a moderated review platform within the app. Instantly learn about new orders or new support tickets as they arrive. Your shopfront and shopping cart look beautiful on any device, helping you to maximise sales. Powerful API that can be used to integrate shop with your current website. Sell confidently in any country with support for different tax rates and currencies. We use the latest security standards to keep your business secure at all times.